If you’re looking for a great quality drill with durability and an increased running time, then the DCD985 model is a perfect addition to your toolbox. Although it doesn’t have brushless technology (since it’s an older model from the DeWalt range), it’s still very reliable and a great alternative to other more expensive drills. It even has 22 different torque settings which allow for more precise torque levels. That said, it still has a max torque of 80Nm. Another great feature that’s exclusive to this model is the electronic brake. It allows the chuck to stop spinning when you release the trigger, making it compatible with screws as well as making your job a lot easier. However, this model only has one light that’s activated when you pull the trigger slightly. Compared to other DeWalt models (which often have 3 lights), this is a bigger disadvantage than you may initially think. On the other hand, the DCD985 still has a 3-speed setting that allows the user to change it up to adjust to the job they’re doing. This is especially helpful for beginners or for those who aren’t familiar with tools. You can also use the settings to adjust to the screws or holes that you’re making. The higher the setting—the faster the job will get done! DeWalt is well-known in the power tool industry for producing great quality items that cover a wide range of prices. This makes them appealing to those who are on a budget, or who are just starting out in the industry since these users often don’t want to spend a lot of money on a drill they may or may not get a lot of use out of. While the feeling of the chuck may not be your first consideration when you’re buying a new drill, it is an essential feature. Having a grip that’s comfortable will determine how much you use the drill. If it gives you blisters or hurts your hands you’re less likely to want to use it. The DCD985 model has a fantastic grip that’s very comfortable and fits well in your hand. When using the drill, the user is able to feel as though they have a tight grip on the drill without experiencing pain or annoyance after a few minutes of use. This design is essential to your whole drilling experience. You have to make sure to get a drill that gives you the best experience possible. Everyone loves a cordless drill—it’s practical and can be transported more easily. Another huge benefit of a cordless power tool is that it can fit into smaller and hard-to-reach areas that you might not be able to reach with a corded electronic. Though we sometimes have to sacrifice power for cordless tools, this model is still very powerful and works perfectly. Being cordless doesn’t affect it negatively at all, which is a huge bonus when you’re considering different drills to purchase. By purchasing this model from an official seller or from DeWalt themselves, you’ll get a 1-year service free of charge and an extended 3-year warranty. You just need to register your item with them. This is great if you worry that you may face any manufacturing problems since you can simply send it to them under warranty and get it back, brand new! How well does this DCD985 model perform? It’s fast, and the battery has a long life, meaning that you can drill away at holes for most of the day and not have any problems with its performance. 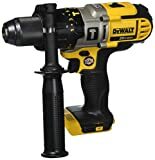 It might not be the fastest drill model you can buy from DeWalt but for the price you pay, it performs really well and does the job it’s meant to do. What more could you ask for! How does this model differ in design from the other DeWalt models? To be completely honest, it isn’t that much different in terms of design as the yellow and black color is pretty standard across DeWalt products—it’s their brand colors. The only design difference that’s significant with this model is the light. Unlike many other DeWalt models which have 3 lights, this one has one. It’s a budget model though so it isn’t to be expected. But if you’re used to having a model with multiple lights on it, this one might surprise you. Is this model good for beginners also? Yes, definitely! If you’re just starting out, then there isn’t a better model for you. The price is great, it has everything you need in a drill, and it performs well too. The instruction guide that’s included with this model is also helpful if you find yourself struggling. Beginners are sure to get sucked in when they find out how much you can do with this model. After reading various reviews and paying attention to forum discussions, we thought it would be appropriate to talk about what the users say about this model. Those who review products online always provide the most honest opinions you’ll get for a product, so it’s important to pay attention to them. Users are happy with this product stating that, while being cheap and lightweight, it performs well and does the job it’s meant to do. It’s perfect for anyone on a budget or those who just want a smaller tool for their toolbox. However, some users say that this model lacks some quality—it’s not the best you can get, and it is a step down since it lacks the brushless technology. Overall, users like this product and recommend it if you have the cash for it. But they also recommend looking a little further if you can afford to spend more. Concluding on this model, we like it. There are many great features and it tends to work for most people. It’s also ideal for beginners. If you’re a professional, you may want to take a look at the more expensive models as they have a lot more features and better elements. But for those who are just beginning, this is a great starter drill. It isn’t too pricey and it’ll last you a long time too, which is great.